Children's author Julie Hedlund, challenged participants of her 12 Days of Christmas for Writers series to post SUCCESSES (rather than resolutions) on our blogs this year. She believes the way New Year's resolutions are traditionally made comes from a place of negativity - what DIDN'T get done or achieved in the previous year. Instead, she suggests we set goals for the New Year that BUILD on our achievements from the previous one. I decided to participate in this Anti-Resolution Revolution! Here is my list for 2018. 1. Attended the Kindling Words Retreat in January where I had some transformational interactions with other writers. Stepped out of my comfort zone in accordance with my word for this past year: brave. Read an unpublished piece during the evening reading and talked to an author I was in awe of (and might have felt too intimidated to talk to otherwise). Made particularly deep and meaningful connections with two writers. 2. Launched an effective pre-order campaign for Flying Deep that lead to 80 pre-orders from my local indie plus an unknown (to me) number of pre-orders elsewhere. 3. Submitted 2 panel proposals to NCTE. Had one accepted. Presented on STEMinist panel at NCTE in November. 4. Scheduled a blog tour and wrote 7 unique blog posts. 5. Actively participated in our Epic Eighteen debut Picture Book group. Posted reviews on GoodReads, participated in give-aways, joined the twitter chat in November. 6. Developed and presented a webinar for The Author’s Guild: Create Engaging School Visits. 8. Participated in #KidLitWomen in March. Launched a comprehensive School Visits Compensation Survey with Jeanette Bradley. We published 5 lengthy blog posts that analyzed the data we collected and made recommendations for future steps. 9. Presented 3 workshops at NESCBWI18. 10. Interviewed on public radio and on the Charlesbridge podcast, Charlesbridge Unplugged. 11. Did 9 bookstore events in 5 states. 12. Received excellent reviews for Flying Deep from BookList, The Horn Book, SLJ, and a STARRED review in Kirkus. Flying Deep was also a summer 2018 Junior Library Guild Selection. 13. Flying Deep was listed as one of the Best New Books for Children by the Washington Post, was on the Kirkus Best Books of 2018, and NSTA’s Outstanding Science Trade Books. 14. Received my first royalty check and Flying Deep went into a second printing. 15. Received many rejections on a picture book biography, including a couple that even went to acquisitions, BUT learned one editor is interested in me turning it into a middle grade biography. Made significant progress on a proposal for that biography this month. 16. Developed a school visits brochure, put all of the info on my website, and started promoting my school visits more widely. What were your accomplishments this year? I know it can be hard to do, but I encourage you to list them and share them publicly, if possible. When looking ahead to the new year, don’t lose sight of what you DID accomplish this year. If you’ve landed here directly, please go back and read our earlier posts to get the context. 82 percent of our survey respondents did at least one school visit for a reduced rate or for free in the last year. This was the aspect of our survey that received the most comments. Many people commented that schools or booksellers expected them to do the visits for free, or that they were often asked to reduce their fees. Some people were ok with these expectations/requests, but most expressed frustration that they didn't feel their time was valued. Several female respondents said that they feel pressured to lower their rates more often than they believe men are. Our survey can’t capture the complexity of this situation, because we don’t have information on the school visits that didn’t happen, or the amount of times people were asked to reduce their rates and said no. Of the visits that did happen, however, male respondents on average did more total visits, more free and more reduced rate visits. Note this graph is based on survey respondents’ reporting of their full-day school visits. We will talk about publisher-sponsored visits, which are generally one assembly per school, later in this post. About half of male respondents’ visits were free or reduced price visits. About one-third of female/non-binary respondents’ visits were free or reduced-price visits. Men did 32% more full-price visits (8.7 vs 5.9) but they did 58% more free/reduced visits, which widened the gap in number of visits. They consider their school visits a charitable contribution, and therefore do not ever charge. They do free school visits in exchange for book sales. They are asked to do visits for free by friends or family members. All of their school visits are publisher-sponsored visits, done as part of a book tour. Looking only at the respondents who did all of their school visits for free, there is a gender gap in the average number of visits done in the last year. Male respondents did an average of 22.4 free visits. 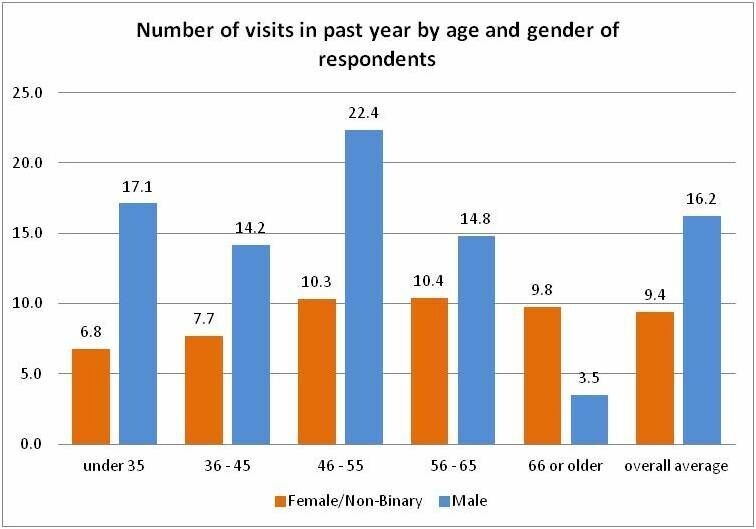 Female/non-binary respondents did an average of 5.3 free visits. Publisher-sponsored visits are usually a part of a book marketing tour. Authors may visit multiple schools in one day, doing one assembly at each one. The publisher pays for the author’s travel, and works with local bookstores to sell books. Bookstores set up events both in their stores and at local schools that are likely to have significant book sales. Note that authors are not paid directly for these school visits. Publishers only sponsor school visits for a portion of their books, generally ones that have a book tour as part of their marketing. 19 percent of our respondents (80 people) did at least one publisher-sponsored school visit in the last year. Together, these 80 respondents did 787 school visits sponsored by publishers. Male respondents with publisher-sponsored visits did an average of 11.9. Female/non-binary respondents with publisher-sponsored visits did an average of 8.5. Since publisher-sponsored visits are an expense taken on by the publisher, one would expect that authors who have won major awards or who have been NYT bestsellers would have more publisher-sponsored visits than those who have not. And that is the pattern we see in our survey responses for men. However, winning an ALA/ALSC/affiliated award did not translate into more publisher-sponsored visits for female/non-binary respondents. In fact, female/non-binary award winners had a lower average number of sponsored visits. Men who have won ALA/ALSC awards did twice the number of publisher-sponsored visits as men who have not. However, women do not see the same increase in numbers. Publisher-sponsored visits are an indicator of the extent of a book marketing tour, but only a very rough indicator. Some tours may include mostly school visits, others may be weighted toward bookstore events. Our survey was focused only on school visits, so we did not ask about other author/illustrator events done in the last year. We would also love to hear your thoughts on pay transparency and the gender gap in author/illustrator school visits. While we are unlikely to single-handedly change the gendered nature of caregiving work, together we can take small steps toward increasing equality in children’s literature. 62% of our school #authorvisit survey respondents did at least one virtual visit. Among authors who did charge for virtual visits, the average fee was $173. Our next full post will focus on free and reduced price visits. 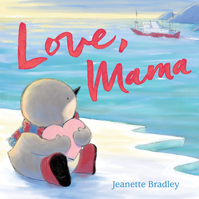 On March 15, 2018, Jeanette Bradley and I launched an anonymous, online survey with the goal of collecting data about author and illustrator compensation for school visits. This is the second post in our series of posts that dig into the data. (Our first post focused on the make-up of our 419 respondents. You can read it here ). Pricing transparency helps us all. Knowing the going rate in your region, your genre, and your career stage, is key to pricing your services to maximize your ability to book school visits at a price that is fair and respects your time and expertise. We asked survey respondents to give us their “average full-day charge for an in-person school visit.” Several respondents commented that they had tiered rates depending on travel distance, or that they offered discounts to low-income school districts or their own local district. Because we asked for an average over all visits, our survey responses were grouped at points of mental rounding. We found the best way to communicate the distribution of day rates was to group responses into ranges, using a common mental rounding point of $250. 8% of respondents did all of their school visits for free. Among respondents who charged for their school visits, the average rate was $1,002. The most common day rate (mode) was $1,000. The middle 50% of respondents who charged had day rates between $600 and $1200. Who are the creators at the top of the range? The eight percent of respondents - those who charged more than $2000 for a full-day visit - had an overall higher-than-average numbers of books published, awards, and were more likely to have published a NYT bestseller. But the most striking thing about this group is that all of them indicated that a booking agent or their publisher books at least some of their school visits. The following charts all exclude the respondents who did all of their school visits free of charge, in order to better represent average rates for creators seeking industry standards. There is some variation in average pricing depending on the category/format people write or illustrate. Respondents who write early readers earned a higher average rate, which appears to be function of those authors having published more books. Many of them have published in multiple genre categories. Career stage matters! The average for debut authors is around $600. Self-published authors are earning much less than traditionally published authors, though some commented that they exchange book sales for school visits. (Anecdotal comment from Michelle: I have heard this often in my school visits workshops and from schools that have had self-published authors visit). Regional pricing differences are fairly large. 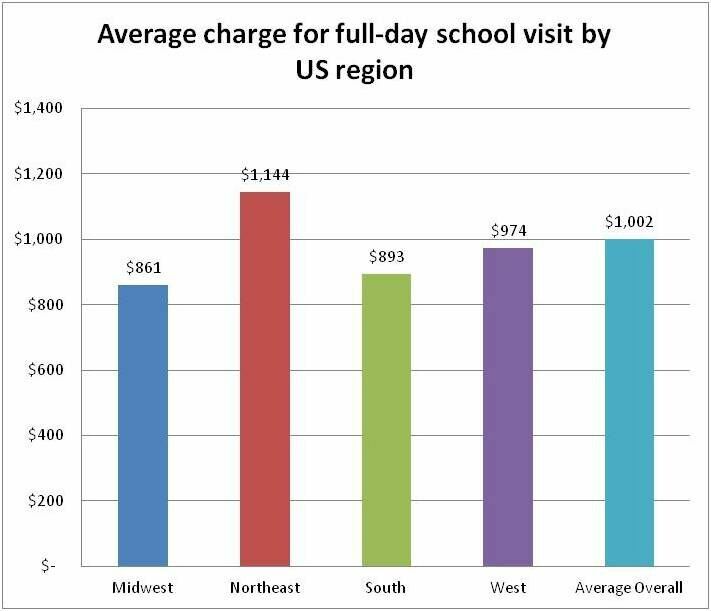 School visits in the Northeast have an average daily rate $283 higher than those in the Midwest. Another said, “I mostly do local visits, in New England, but my friends who are authors in the Midwest feel that the going rates there are lower than on the East Coast.” The data supports this opinion. Respondents who booked their school visits through a booking agency charged an average of $538 more per day than those who did not. We asked respondents: “Have any of your books won a national ALSC, ALA, or affiliated award? (For example: Caldecott, Newbery, Coretta Scott King, Printz, Stonewall, American Indian Youth Literature Award).” We realize there are many other awards and honors that a book can win, but we chose these because of their prominence in the industry, and their potential to affect school visit rates. 16 percent of respondents have won a national ALA/ALSC award. Respondents who won a major ALA or ALSC award earned on average $480 more per visit than those who did not. Awards have a huge impact on the careers of authors and illustrators. One part of that is the increases in fees that creators are able to charge for speaking engagements and school visits. Recent analyses, such as Christine Taylor-Bulter’s audits of the Caldecott and Coretta Scott King awards, have shown that there is still a huge gender gap in the recipients of these awards. The ripple effect of these gaps spreads out into the pricing of school visits - survey respondents who had won an ALA or ALSC award at any point in time earned an average of 50% more per visit than those who had not. 17 percent of respondents have had at least one book on the NYT bestseller list. Bestseller status translates into an average charge $708 higher than those who have not had a NYT bestseller. We asked respondents if their most recent book had received a starred review from the following publications: Publishers Weekly, Horn Book, Kirkus, and School Library Journal. 31 percent of respondents had received a starred review on their most recent book. 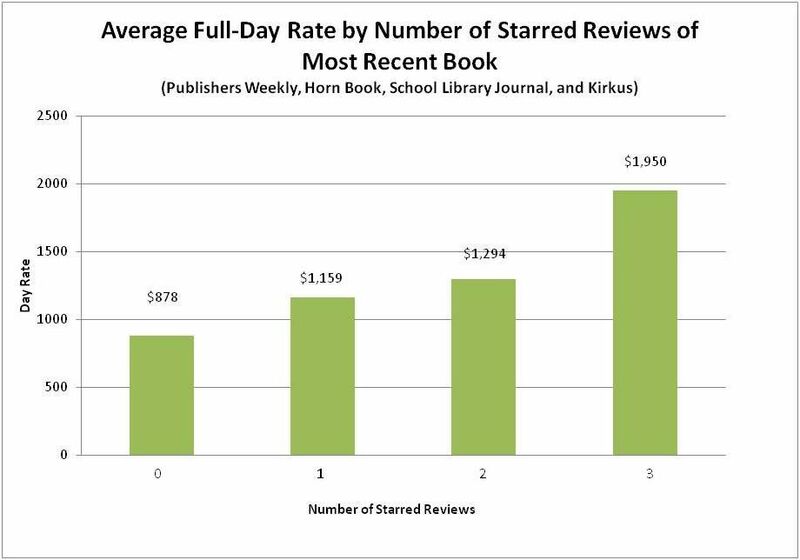 Starred reviews have an impact on the amount respondents charge - each star appears to add value. A day rate is not the only important factor in school visits – the other is the number of visits respondents are doing each year. Many respondents reported difficulty booking with schools at rates that they felt were fair to the use of their time. Respondents who have published more books did more visits in the last year – up to a point. In our next post, we'll dig deeper into the statistics: Is there a gender gap in school visits? Watch for that post soon. (If you want to be sure you don’t miss the posts, you can subscribe to this blog on the right sidebar and get it delivered to your inbox). NOTE: I apologize for posting this later than we intended. Life sometimes demands our full attention. ETA (September 13,2018): If you got here from the SCBWI PRO Insider newsletter, this post lists all of the posts with results related to our survey. On March 15, 2018, Jeanette Bradley and I launched an anonymous, online survey with the goal of collecting data about author and illustrator compensation for school visits. (Sometimes called author visits). There are many aspects we could have chosen to investigate, but we needed to keep the survey focused so that people would fill it out, and we would be able to crunch the numbers and make sense of the data (This is a volunteer effort, after all). Therefore, we limited this survey to residents of the U. S. who have at least one book published. It’s not that we didn’t want to go wider. We simply couldn't manage that much data. You may wonder why Jeanette and I are the ones who ran this survey. I first had the idea to do this because I care deeply about school visits. I facilitate workshops to help authors and illustrators develop engaging school visit programs. One question I face in every workshop is “How much should I charge for school visits?” Or the even more troubling, “Wait. I should be paid for school visits?” Over and over again, I’ve stressed that authors and illustrators should be compensated fairly for their time. Yet, what is the “going rate?” What is fair? I asked Jeanette Bradley to partner with me on this survey because her first career was as a policy researcher focused on studying housing and lending discrimination. She has experience writing and analyzing surveys about sensitive topics. This survey would not have been possible without Jeanette's expertise. Angie Isaacs, another KidLit person with advanced statistics experience also reviewed our results before we published them. Ultimately, however, Jeanette and I are responsible for the final reports, so any mistakes sit with us. Respondents had to be residents of the U. S.
Respondents must have at least one book published, either traditionally or indie/self-published. All data was kept anonymous. No identifying information was collected, and the results are being reported in aggregate format. Our personal pages on Facebook. Various KidLit groups and pages on Facebook (e.g. KidLit 411, Picture Book 12x12, Create Engaging School Visits, the KidLit Women community page and private group). Twitter. (We used the following hashtags to get more attention: #KidLitWomen, #KidLit, #MGLit, #YALit, #KidLitArt, and asked people to share/ retweeet widely). The Authors Guild social media channels. Thank you to everyone who took the time to complete our survey. We appreciate your time and honesty. In addition, many people wrote extensive comments about their experiences when given space to do so. We’ll try to cover the depth and breadth of experiences by sharing selected comments within our posts. People are subtle, complex, and multifaceted. Surveys are blunt instruments for measuring the breadth of human identity and experience. We recognize that gender is not binary, and neither is race/ethnicity. However, given the size of our survey, we have split our data into two categories on both of these identity variables, in order to protect the privacy of survey respondents. We asked survey respondents to self-identify as one of these gender categories: male, female, non-binary, or a write-in “other” category. About one percent of respondents identified as non-binary; no respondents chose the write-in “other” category. Because there are a small number of respondents in the non-binary category, and we want to protect the privacy of respondents, we were faced with two choices. We needed to either exclude the non-binary respondents from the survey analysis, or we needed to combine them with a gender category that contained more responses. We chose to combine the non-binary respondents with the respondents who identified as female, because we felt it was better to keep their data in the survey and identify what we had done than to erase a category of people from the survey. We combined non-binary respondents with female, rather than male, respondents, under the theory that they are both groups that experience systemic discrimination. We asked respondents to identify themselves with as many of the following race/ethnicity categories which they felt applied: American Indian or Alaskan Native, Asian or Pacific Islander, Black or African American, Hispanic or Latino, White / Caucasian, Other (please specify). Because some racial categories had only a handful of respondents, we chose to combine everyone who identified themselves as American Indian or Alaskan Native, Asian or Pacific Islander, Black or African American, Hispanic or Latino, as more than one category, or who wrote in that they identified as mixed-race, as a Person of Color or POC. (Note that respondents who wrote in that they were, for example, “Scotch-Irish” or “Ashkenazi Jewish” were coded as white). We realize this does not capture the rich complexity of racial and ethnic identity, but it is a small survey, intended to look at the general picture, and our goal is to protect the privacy of respondents while describing sensitive information. Our results are based on the 419 respondents who had done at least one author or illustrator school visit in the last year who filled out our survey. Three-quarters of respondents were female, which is similar to the demographics of the children’s literature industry as a whole. 1 percent of respondents identified themselves as non-binary. With so few respondents in this category, it would be easy for someone to trace specific answers to individual respondents, so we have grouped the non-binary respondents with female respondents in our results. Respondents live in all regions of the United States, with 39% of them hailing from the Northeast. 89 percent of respondents identified as white. 11 percent identified as either American Indian or Alaskan Native, Asian or Pacific Islander, Black or African American, Hispanic or Latino, or some combination of multiple racial/ethnic identities. This is similar to the 14 percent of children’s book authors who were identified as people of color by the CCBC count in 2017. To protect the privacy of our survey respondents, we have grouped all people who reported that they were mixed-race/ethnicity or were a person of color together into one category. We know from research by the Cooperative Children’s Book Center’s (CCBC) annual count that authors of color are underrepresented in children’s literature. But because of the number of respondents in this survey, and the fact that it deals with sensitive topics, we wanted to err on the side of caution in reporting survey results. (Again, some categories had only a few people who responded). 81 percent of our survey respondents are authors. Only 2 percent are illustrators. This may be because illustrators do fewer school visits, or it may have to do with the places where our survey was shared. While we cannot know who exactly saw the survey promoted, it's possible we mostly reached writers. Survey respondents write across the breadth of children’s publishing. 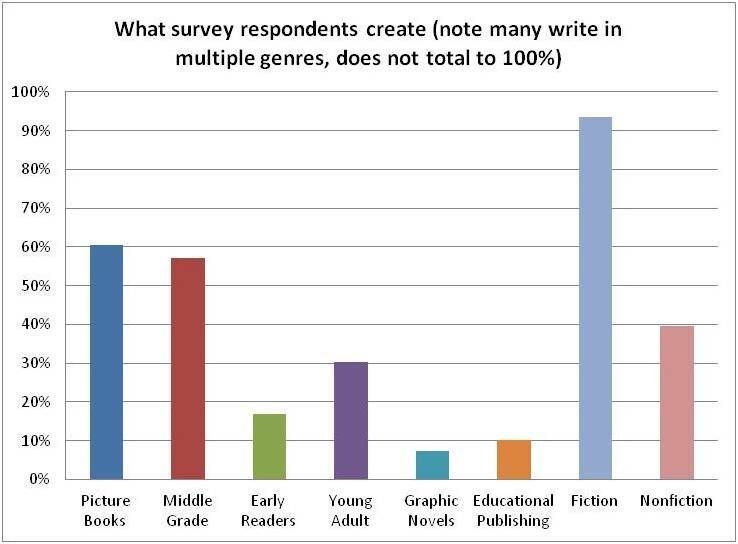 Many write for more multiple age groups, some write both fiction and nonfiction. Others noted that they are also poets or have published adult novels. Respondents hail from all career stages. It is difficult to capture an author’s career in one metric, but here we simply use the number of traditionally published books. 3 percent of respondents have no traditionally published books, and have solely self- or indie-published. We felt that it was important to include these respondents in the survey results, as this is a growing part of the publishing landscape. The majority of survey respondents earn less than a quarter of their household income from their work as authors and/or illustrators. Only 21 percent earn more than half of their household income from their author/illustrator work. One respondent commented: “Your 0-25 percent choice is misleading. I'm still a negative sink on my family.” Since we did not ask this specific question, we do not know if other respondents might have said the same thing. Now, on to what you all want to know: how many school visits are we doing? What are we earning? Overall, respondents did 4,540 school visits in the last year! The average number of visits per respondent was 10. The average day rate (among the 92% of respondents who charged for visits) was $1,002. See our future posts in this series for more details regarding pricing by career stage, location, and more! We expect the second post to go up on Friday and to be followed by two more posts next week that dig deeper into the data. (To be sure you receive them, you can subscribe to my blog on the side bar). We (Jeanette Bradley and Michelle Cusolito) volunteered our time and expertise to bring you the results of this survey. We’d appreciate any support can offer in return. Perhaps you could buy our books (or rather, pre-order Michelle’s), request them from the library, tweet about them, or write a review if you’ve read them and enjoyed them. Thank you for considering. Today, Jeanette Bradley and I are launching an anonymous survey to collect data about author and illustrator’s compensation for school visits (Sometimes called author visits). One of our goals is for there to be greater transparency in compensation. There are many aspects we could have chosen to investigate, but we need to keep this survey focused so that people will fill it out and we will be able to crunch the numbers and make sense of the data (This is a volunteer effort, after all). To that end, we have had to limit this to residents of the U. S. who have at least one book published. It’s not that we don’t want to go wider. There’s no way for us to manage that much data. (Also, having recently moved back from Ireland where I did some school visits, I realize how very different this is, country by country). If you are an author or illustrator who creates books for children through young adults and you do school visits in the U.S. please take our anonymous survey. It will take less than 5 minutes. Please be as honest and accurate as possible. Transparency is important to removing inequities, and the results are only as good as the data we collect. Please invite everyone you know who does school visits to fill it out, as well. You may wonder why Jeanette and I are the ones running this survey. I first had the idea to do this because I care deeply about school visits. I facilitate workshops to help authors and illustrators develop engaging school visit programs. One question I face in every workshop is “How much should I charge for school visits?” Or the even more troubling, “Wait. I should be paid for school visits?” (Anecdotal comment: I’ve never had a man ask me that question, which is partially what inspired me to want to dig deeper). Over and over again, I’ve stressed that authors and illustrators should be compensated fairly for their time. Yet, what is the “going rate?” What is fair? (If you want to know more about why book creators should be paid for school visits, I encourage you to read this excellent post by Caroline Starr Rose). I asked Jeanette Bradley to partner with me on this survey because her first career was as a policy researcher focused on studying housing and lending discrimination. 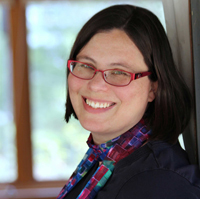 She has experience writing and analyzing surveys about sensitive topics. Angie Isaacs, another KidLit person with advanced statistics experience will be reviewing our results before we publish them. Respondents must be residents of the U. S.
Respondents must currently do school visits in the U.S.
All data is anonymous. No identifying information will be collected, and the results will be reported in aggregate format. The data collected will determine what our reporting looks like. There will be a minimum of one public blog post to share results, but there could end up being a series of posts, depending upon the data we collect. The survey is open from March 15-31. The results will be published here by the end of April (sooner if we can manage it). Again, please help us out by taking the survey and sharing it widely so others will take it, as well. Me during a school visit for my debut, Flying Deep. Yesterday was a glorious spring day here in my sleepy little town, but I had loads of work to do that required my computer and an internet connection. My solution: I bribed myself. "Get the 'administrivia' done as soon a possible so you can hike to your lakeside 'office' and write." I blasted through my work, ate an early lunch, and headed out. I love our woods year round, but I especially love early spring days when beech trees display their new finery- delicate, ridged green leaves, soft like silk. My "office." A bench built by my 10 and 14 year old and placed so others can enjoy the spot. Yesterday was a day when I felt deep gratitude to be alive in this place on this particular day. A day of honking geese whose voices echo off the trees. Of silent swans flashing feathery fans. A day of songbirds skittering as they build nests among bushes. Of bumblebees defying engineering principals and flying even though it shouldn’t be possible. Of ephemeral Lady Slippers preparing to bloom. A day of turtles popping periscope heads up to look around and take a breath. A day of tufty grasses poking through sand. and crickets chirping in the meadow on the hike home. Yesterday, my family went to see the herring migrating in a local river. My son shot underwater video by placing his iPod in a sealed Mason jar. He then created this video using iMovie. Last week I received amazing news. I am one of the authors being honored with a PEN New England, Susan P. Bloom Children's Book Discovery Award for my manuscript FLYING DEEP. This award honors emerging writers- writers whose work has not yet been published. All of the winners will read their work and receive awards at Simmons College in Boston, MA on the evening of May 15th. FLYING DEEP invites young readers to imagine themselves as a pilot of deep-sea submersible Alvin, exploring hydrothermal vents two miles deep where alien-looking life forms thrive far from the sun’s rays. I spent many months researching in order to get the details just right. The highlight of my research was a trip to Woods Hole Oceanographic Institute (WHOI) where I met with Bruce Strickrott, Manager of the Alvin Group, and got to climb inside Alvin. To learn more about Alvin, and see some of the resources I used in my research, check out the my FLYING DEEP Pinterest board. The "Kids to Parks" giveaway ended last night. The winner is Kimberly H. I emailed Kimberly this morning. Thanks to all of you who entered and thanks to National Park Trust for the terrific prize pack. I hope you'll participate in "Kids to Parks Day" next year. But I also hope you don't wait until then to visit a federal or local park. Get out there exploring this summer. I went for a woodland walk with my daughter and her friend yesterday. It was 38 degrees F and sunny, which felt glorious after months of being buried in snow and cold weather. We were surprised, however, by how much snow is still on the ground. Walking was tough- we'd go a few steps on top of the snow, then suddenly sink in. We got quite a workout. But the sun was warm and lovely, so we stopped at a fallen tree to appreciate the sun and stillness, and beauty. while the girls recorded their poetry ideas. Then we headed back feeling relaxed and refreshed. What fun nature experiences have you had lately? Last weekend, 10 students were fortunate to create their own nature journals using traditional bookbinding techniques. This MOBY class (paid for with federal funds through the Massachusetts Board of Library Commissioners) was free to participants. Teacher Benares Angeley, owner of the Children's Art Lab in Mattapoisett, MA, taught students to create two kinds of books: the 3-holed pamphlet stitch and the secret room book. Students started by making a small pamphlet stitch journal out of paper. Students were encouraged to decorate their paper journals using a variety of beads. Then they learned the secret room book, which involves folding and cutting one piece of paper. While Benares prepared the cereal boxes students had brought for the project, students "broke in" their journals. Benares told students a great piece of advice she got from a teacher she once had: If you don't write in your newly created journal, it can become too precious and you never want to write in it. So she gave students an open-ended prompt to get them started. I completely understand Benares' point. I had to stop buying nice journals for my day-to-day writing. I wouldn't use them because I worried the writing might not be worthy of such a journal. I now write all of my first drafts in regular old school notebooks or composition notebooks. I save the journals for when I'm traveling. I generally choose one journal per trip and include all of my notes, sketches, and ephemera from that trip. Once students had a chance to break in their journals, Benares took them through the 3 holed pamphlet stitch again. This time they created a larger journal with a cardboard (cereal box) cover. Once students finished stitching their journals together, they were encouraged to decorate them however they chose using the variety of materials provided. They were given beads, paper scraps, markers, pencils, colored pencils, etc. Benares told them to ask if they wanted a material and didn't see it. Several students asked for fabric and within minutes, Benares reappeared with scraps of material, ribbon, and lace. I enjoyed watching how students surveyed the materials, selected what to use, and then executed their ideas. One student collaged with paper, another with yarn, and others with ribbon. One student was inspired by a sample journal and used waxed linen to stitch animal tracks on her cover. The beginning of a bear track. a few examples of their creations in progress. Overall, the feedback was excellent. Several students said they want to come back to learn more advanced techniques.